Imagine exercising to fight an autoimmune disease. That’s Lisa’s reality, but she doesn’t get down about it. She embraces it. She uses exercise and nutrition to fuel a healthier life! My story is very different from any transformation story you have read. It's not about losing 100 pounds or recovering from an accident or major trauma. My story is one of surviving and living with an autoimmune disease. I live today and every day of my life with lupus, not knowing what the next day will bring! Lupus affects more than 1.5 million Americans. It's an autoimmune disease in which the immune system goes into overdrive and attacks the body, leaving it vulnerable to other illnesses. Symptoms of lupus can be very similar to those in other diseases, making it difficult to diagnose. Symptoms include extreme fatigue, headaches, painful or swollen joints, fever, anemia, edema in the extremities, pain in the chest or during deep breathing, butterfly-shaped rash across cheeks and nose, sun- or light-sensitivity, hair loss, abnormal blood clotting, Raynaud's phenomenon and/or mouth or nose ulcers. In 1986, I became very ill with some crazy symptoms. I had bloody noses that lasted for hours and bruises all over my body. I tried high doses of steroids to try and suppress my immune system and even IV steroids. The steroids were prednisone, not anabolic. These treatments where not working and the doctors decided they needed to open me up and do exploratory surgery to see what was going on. This was when my spleen was removed. If you look on the left side of my body you can see what I call "the bullet hole." It's a result of the feeding tube being placed in me. Bad news: scared for my life! I had major symptoms of this disease in 1986 and 1991, which led to me being hospitalized for months. Finally, in 1993, I was diagnosed with lupus, and it was the most severe case possible. This could be a very long story, but I will try and make it as short as possible. I've had everything and anything related to lupus occur to me and some of the symptoms more than once. Lupus has attacked every part of my body at one time or another: my brain, central nervous system, heart, lungs, spleen, kidneys, liver, and joints. Basically my whole body! When I was first diagnosed, I was on break from college in 1993 and rushed to the emergency room in Davenport, Iowa. The doctors really had no clue what was happening to me. All they knew was my body was going wild! This is when they decided to test me for lupus. To be diagnosed as having lupus, a person needs to have four of the 11 symptoms. I was lucky; I had 11 of 11! Up until this day, lupus literally has been trying to kill me. I WILL NOT LET IT! From 1993 to this very day I have been through chemo therapy not once, but five rounds, each lasting at least 18 months. I also got to experience all the wonderful side effects of chemotherapy. I have been told I had cancer, had complete blood transfusions, and spinal taps. I WILL NOT LET IT KILL ME! One of the worst years of my life was the year lupus was going to kill me. I was truly ready for death as I laid in a hospital bed at The University of Iowa with West Nile. After months of not doing so well, many of my family members feared my outcome was not going to be good. Some of my symptoms included: Class 4 nephritis and cerebritis, which caused many grand mal seizures and TIAs (mini strokes). Basically, my brain was being attacked. It was a very scary and dark time; difficult to express. I wondered if my memory would ever be back to normal. My weight got down to 72 pounds, including my hospital gown and blankets in my bed. I was unrecognizable! I spent many nights struggling in ICU and many months at The University of Iowa City Hospital. During this time, my sweet grandma passed away. Two weeks later, my grandpa followed her. Another horrifying year for me was in 2003. I call this story "The Ghost Of Randy." This was the year I contracted West Nile along with CMV. With a compromised immune system, I was a good candidate. The day of my vision or epiphany: I wanted to die. I remember right before falling asleep, I prayed and asked God to please take me. I was sick and tired of suffering. This is the night Randy came to me. Randy is my stepfather who had passed with pulmonary fibrosis and was a very important person in my life. That night Randy came to me in my dream and/or vision he looked at me and said, "Lisa, it is not your time. You have more work to do!" I immediately woke and was in a cold sweat; breathing hard. From that moment on I fought even harder to get my life back! It took me over a year to get back to what I call normal. Randy was a sweet, genuine man. This year on Memorial Day, after teaching a two-hour step and weight class, I took a yellow rose to his grave site to thank him for making me fight. Yellow roses were his favorite flower to give to my mother. 1995: I was in Iowa City again. 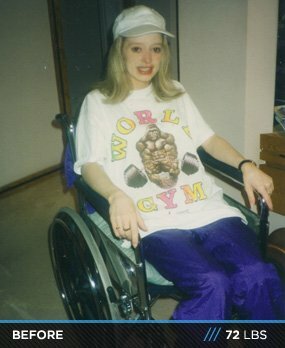 This time the doctors said I was crazy and put me in the psychiatric ward after months of seizures, strokes, chemotherapy, and tons of steroids! I had chemo in 1996, 1999, 2001, 2003 (and West Nile), and 2005. My last major battle was a tough one in 2009 at the Mayo Clinic. For a little over three years, I have been pretty good with some minor issues, but nothing major. I attribute this to chiropractic care, acupuncture, diet, and exercise. I accomplished my goals by taking it one day at a time and learned to have more patience than I have ever had before in my life. As soon as I was able, I got right back into life, exercise, and nutrition! I have always been diligent about eating clean, supplementing with whole foods, and supplementing to help heal my body. I'm a very firm believer in chiropractic and acupuncture healing affects. The last few years have been wonderful. I love my career as a fitness director, group exercise instructor, and personal trainer. I love the gift I have been given to help people in their struggles and achieve their goals. I continue to eat healthy and clean and I have been exercising harder than ever without fear. I feel so blessed to be able to do what I can do! Please keep in mind that due to the high volume of classes I teach, my weight training will vary. My weight training sessions are short and to the point; 4-8 sets per body part with high reps and low weight. I compete in bikini, so I'm not trying to become a bodybuilder. I'm a certified personal trainer and train 7-10 people per day, Monday-Friday. My day usually starts around 6 a.m. and ends around 7 p.m.
My biggest challenge hasn't been the diet or the exercise. My biggest challenge is keeping my lupus in check! I do this through clean dieting, clean supplementation, exercise, chiropractic, and acupuncture. I have noticed that if I start training too hard or with heavy weights my lupus will start to flare. I would love to become a pro bikini competitor in an all-natural affiliation. I would love to become a successful fitness and bikini model. A very admirable goal of mine would to become a sponsored athlete or a fitness and bikini model and hopefully make this a new career. To become an IFBB pro bikini competitor? That's a tough one, but I am determined to give it my very best shot. By the grace of God and my strong support structure, I'm very focused and determined. To help every single person I come in contact with to be better people through fitness, diet, and exercise. Life gives you challenges to face and we can only grow and become stronger from the obstacles we overcome. Treasure each healthy day as if it was your last day on this earth and feel completely blessed and lucky to be a part of this world. Anything is possible. Don't stop trying and keep moving forward. The articles and supplements are phenomenal! You can absolutely find anything you want on this site that pertains to fitness, exercise, and nutrition. The knowledge from this website is never-ending! Bodybuilding.com has virtually transformed me into a fitness competitor. I am inspired by Jamie Eason. I love her recipes and fitness tips. Everything an athlete or prospective athlete would need to get started is right here on Bodybuilding.com.